Thinking about self-control takes us to the heart of practical decision-making, human agency, motivation, and rational choice. Psychologists, philosophers, and decision theorists have all brought valuable insights and perspectives on how to model self-control, on different mechanisms for achieving and strengthening self-control, and on how self-control fits into the overall cognitive and affective economy. Yet these different literatures have remained relatively insulated from each other. Self-Control, Decision Theory, and Rationality brings them into dialog by focusing on the theme of rationality. 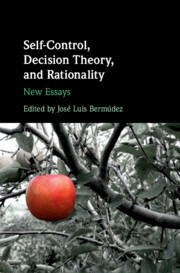 It contains eleven newly written essays by a distinguished group of philosophers, psychologists, and decision theorists, together with a substantial introduction, collectively offering state-of-the-art perspectives on the rationality of self-control and the different mechanisms for achieving it. General introduction José Luis Bermúdez; 1. Temptation and preference-based rationality Johanna Thoma; 2. Self-prediction and self-control Martin Peterson and Peter Vallentyne; 3. Rational plans Paul Weirich; 4. Self-control and hyperbolic discounting Arif Ahmed; 5. Preference reversals, delay discounting, rational choice, and the brain Leonard Green and Joel Myerson; 6. In what sense are addicts irrational? Howard Rachlin; 7. Why temptation? Chrisoula Andreou; 8. Frames, rationality, and self-control José Luis Bermúdez; 9. Exercising self-control: an apparent problem resolved Alfred R. Mele; 10. Putting willpower into decision theory: the person as a team over time Natalie Gold; 11. The many ways to achieve diachronic unity Kenny Easwaran and Reuben Stern. José Luis Bermúdez is Professor of Philosophy at Texas A & M University.